Essential oils are well loved by lots of families. They are a convenient way to get some natural healing power (including fighting the flu!) and are readily available in many stores. However, they are very potent and for children, it can be confusing on how to use essential oils safely. 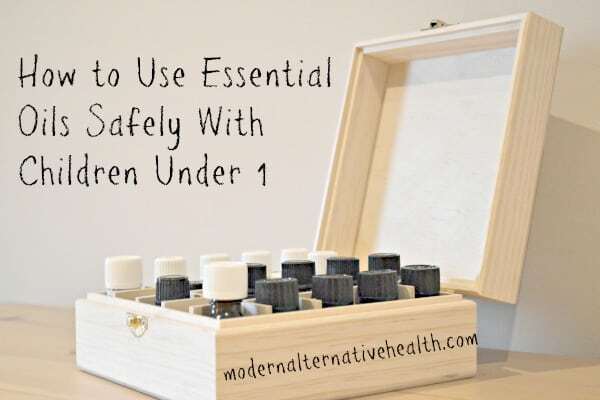 In this post, contributing writer, Jacki May, helps to sort out a few guidelines to follow and what essential oils are safe to use with babies. As with all essential oil use (yes…ALL), you should always be diluting your essential oils with a carrier oil. I like Olive oil but many people love Sweet almond oil, Coconut oil, Sunflower oil…etc. Diluting an essential oil does not dilute the potency. It just gives it a fatty acid to bind with, making it safer for your body to absorb. For children under 1 the dilution rate for regular use is .5%. That is 1 drop of essential oil per 2 teaspoons carrier oil. In acute cases, like a cold, you can increase the percentage to 1% or 1 drop of essential oil per 1 teaspoon of carrier oil. This is probably the most confusing things for parents. MLM companies, wanting to sell their essential oils will say that they are safe because they are natural, but in fact, for children under 1 there are only a few that we can use. The biggest concern for children under 1 and essential oils is breathing issues. Many essential oils that are used often contain constituents that can cause lower respiratory rates in children. Then, many essential oils can cause topical irritation, especially for young children. For those with young children and wanting to use essential oils, I highly recommend getting Valerie Ann Worwood’s book “Aromatherapy for the Healthy Child”. It is a comprehensive guide for what to use and when. *Spearmint is safe for occasional use in children. It is the child friendly alternative for Peppermint (also safer for pregnant women). **Safe for occasional use, not for daily use outside of acute need. Diffusing essential oils is a great way to enjoy the benefits of essential oil, but still stick with child friendly essential oils, like those listed above. I sell a blend called Inner Peace – which is a blend of Mandarin, Chamomile roman, and Lavender….all child friendly and calming. Diffuse in 30 minute increments, resting for 30 minutes in between. This allow yours body to process the essential oils through your olfactory receptors, which get full after about 30 minutes (think about how a stinky place doesn’t smell after a while, your receptors filled up). When plant matter is distilled, two products come out: essential oils and hydrosols. Hydrosols are amazing preparations for children, and still contain small amounts of essential oils in them. Many people are familiar with Rose water…which in its true form…is a hydrosol! They do smell slightly different than the bottle of essential oil but for some expensive essential oils, like Neroli, the hydrosol does great work for a fraction of the cost. Children should never take essential oils internally. Certain essential oils blends (like OnGuard or Thieves) are NOT safe for children under 1. ALWAYS check blends for their individual essential oil content to see if they are safe for children. If redness occurs, immediately wash the area with soap and water, then apply a carrier oil over the area. Never use just water. 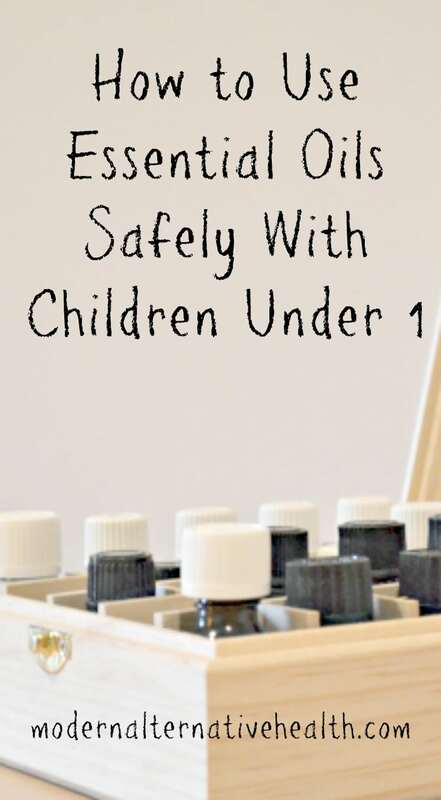 Do you use essential oils safely with children under 1? What are you favorite ways to use them? Why are “On Guard and/or Thieves” not safe? Can you explain in detail? Long time reader – I absolutely love the content you publish about essential oils. I think they are so incredibly underrated. I’ve been using them for years and the effects have been life changing. Another new site I just started following is http://www.essentialoilexperts.com Have you heard of them? Their information is really easy to follow. Would you mind talking about tea tree oil more in depth? I want to know if I can use it to help my child’s skin (he is currently 6 and 3 months).